A new study conducted by researchers at the University of Sydney shows that global tourism, a trillion-dollar industry, contributes significantly to greenhouse gas emissions and its carbon footprint is expanding rapidly. 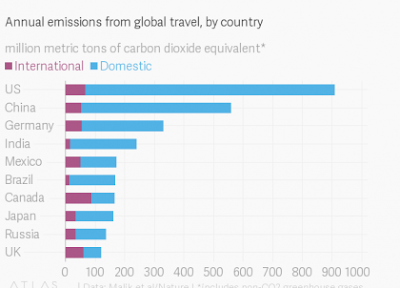 Domestic and international tourism account for eight percent of total worldwide carbon dioxide (CO2) emissions, researchers have found. The study was based on data from 189 countries around the globe. It showed that the industry’s carbon footprint was driven mainly by demand for energy-intensive air travel. “Tourism is set to grow faster than many other economic sectors,” with revenue projected to swell by four percent annually through 2025, said lead-author Arunima Malik, a researcher at The University of Sydney's business school. The aviation industry accounts for two percent of all human-generated C02 emissions, and would rank 12th if it were a country. According to the International Air Transport Association (IATA), the total number of air passengers is expected to almost double by 2036 to 7.8 billion per year. Half of the 14 percent total increase of emissions due to global tourism occurred in high-income countries from 2009 through 2013, the study found. However, middle-income countries recorded the highest growth rate at 17.4 percent per year for the period. As in past decades, the United States was the single largest emitter of tourism-related carbon emissions. Germany, Canada, and Britain were also in the top 10. China was in second place and India, Mexico, and Brazil were 4th, 5th and 6th, respectively.